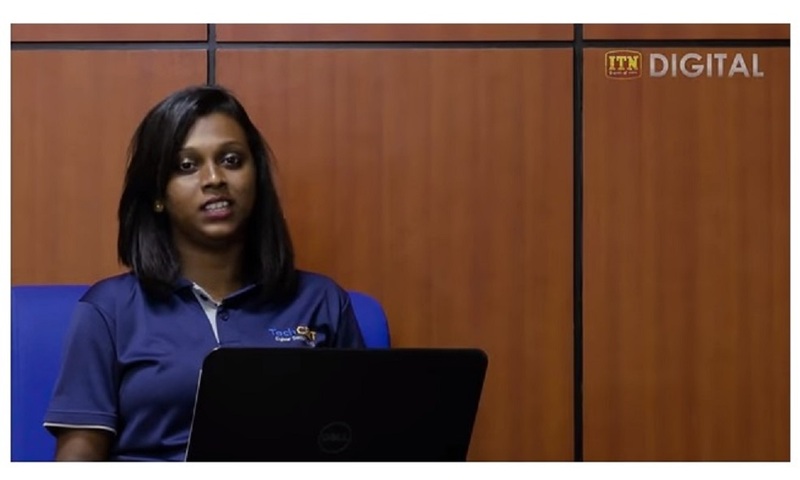 Wireless network එකක් හා cable network එකක් මඟින් මූලිකව අපව අන්තර්ජාලයට සම්බන්ධ කිරීම සිදු කරයි. නමුත් Wireless network එකක් මඟින් අන්තර්ජාල පහසුකම් ලබා ගැනීමේදී අපට ලැබෙන ප්‍රධාන සහකරුවන් වන්නේ, භාවිතා කරන උපකරණ පහසුවෙන් එහා මෙහා ගෙන යා හැකි වීමයි. දැනට අප භාවිතා කරන සියළුම උපකරණ වල wi-fi පහසුකම් සහිත වේ. එමඟින් අපගේ බොහෝමයක් කාර්යයන් කාර්යක්ෂමව සිදු කිරීමේ හැකියාව අපට පවතිනවා. අපගේ කාර්යබහුල ජීවිතයේදී Wireless network එකක් භාවිතා කිරීමට පුරුදු වෙනවා සේම එහි ආරක්ෂාව ගැනත් සැලකිලිමත් වීමත් ඉතා වැදගත්. ඒ අනුව අපි දැන් කතා කරමු Wireless network එකක් ආරක්ෂාකාරීව භාවිතා කිරීමට උපකාරී වන වැදගත් කරුණු කිහිපයක්. මුලින්ම ශක්තිමත් මුරපදයක් (Password එකක්) භාවිතා කිරීම වැදගත් වෙනවා. අද බොහෝමයක් දෙනා Password එකක් විදිහට හැඳුනුම්පත් අංකය, උපන්දිනය, සුරතලාගේ නම ආදී ලෙස ඉතා පහසුවෙන් කෙනෙක්ට අනුමාන කල හැකි Password එකක් භාවිතා කිරීමට පුරුදු වෙලා තියෙනවා. මීට අමතරව Wireless routers භාවිතා කරන සෑම අවස්ථාවකදීම ක්‍රියා විරහිත කර තැබීම ඉතා ආරක්ෂාකාරී පියවරක් විදිහට සලකන්න පුළුවන්. ඒ වගේම තමයි Guest network එක ක්‍රියා විරහිත කිරීමත් සිදු කල යුතුම දෙයක්. සාමාන්‍යයෙන් බොහෝමයක් උපකරණ වල by default guest network එකක් සක්‍රීය කරලා පවතින්නේ. ඉතින් මූලික configuration සිදු කලාට පස්සේ Guest network එක අනවශ්‍ය නම් ක්‍රියා විරහිත කර තැබීම අත්‍යාවශ්‍ය කරුණක් වගේම අප බොහෝ දෙනාට මඟහැරෙනම කාරණයක් විය හැක. දැන් අපි බලමු wi-fi router එකේ display name එක ගැන. සාමාන්‍යයෙන් router එක අපට ලැබෙන්නේ පොදු user name එකක් හා password එකක් එක්කයි. මුලින්ම අපි කලින් කතා කල විදිහට ශක්තිමත් password එකක් දැමීම කරන්න ඕනේ. ඊලඟට අපගේ wireless network එකේ තොරතුරු පහසුවෙන් එලියට නොලැබෙන පරිදි display name එක වෙනස් කල යුතුයි. එය අපට Alpha connection හෝ Beta connection වැනි කිසිඳු වැදගත් තොරතුරක් ලබා නොදෙන පරිදි සැකසීම ඉතා වැදගත්. ඉතින් මේ මූලික කාරණා වලට අමතරව ටිකක් ගැඹුරින් wireless network එකේ ආරක්ෂාව ගැන හිතනවා නම් අවධානය යොමු කල යුතු කරුණු කිහිපයක් තිබෙනවා. 1- Firewall කියලා wireless network setting එකක් තියෙනවා. එ්ක සක්‍රීය කිරීමෙන් අපිට අනවශ්‍ය incoming හා outgoing සම්බන්ධතා අවහිර කිරීම සිදු කල හැකිය. ඒ වගේම තමා: MAC Filters සක්‍රීය කිරීම මඟින් අපගේ router එකට සම්බන්ධ වෙලා තියෙන උපකරණ හඳුනා ගෙන අනවශ්‍ය උපකරණ අවහිර කිරීමටත් අවශ්‍ය උපකරණ පමණක් සම්බන්ධ කිරීමටත් හැකියාව පවතිනවා. මේ විදිහට අපගේ wireless router එකේ මූලික සැකසුම සදු කරන්න පුළුවන්. ඒ වගේම ඔබගේ wireless network එකත් ඉතාම ආරක්ෂාකාරී වේ. “IT Yahamaga” is an interactive program creating awareness among school children and youth, on the advantages, safety and positive uses of the internet. These programs are conducted Island-wide through Sarvodaya Fusion under the approval of Ministry of Education, with the sponsorship of LK Domain Registry. Through this platform, the students are educated of the incidents where cyber space has been used as a mode for criminal activities, which may result a great deal of social issues, sometimes ending up with hatred, divorce cases, teenage suicides, etc. Most of these wrongdoings happen with the use of social media. Therefore, we aim at making students aware of capturing only the best practices of social networking sites, providing them a wide range of successful stories, where technology has been used to bring about positive change in the society as well as personal growth. In addition to that, the students, IT teachers and principals are trained on the useful links to develop the IT skills. In January 2019, programs for a total of 2374 children covering 500 in Puttlam District, 406 in Hambantota, 973 in Ratnapura and 495 in Kurunegala have been conducted successfully. Moreover, LK Domain Registry wishes to provide sponsorship for 10,000 students, 1000 teachers and 125 principals in 2018 / 2019. This project titles as “Hithawathi-Your Confidante” which was initially commenced in January 2014.Hithawathi project is a help desk designed for the victims and casualties of technology / internet related activities. The project was initiated by the community members of Internet Society – Sri Lanka Chapter (ISOC-LK)and LK Domain Registry (LKDR). 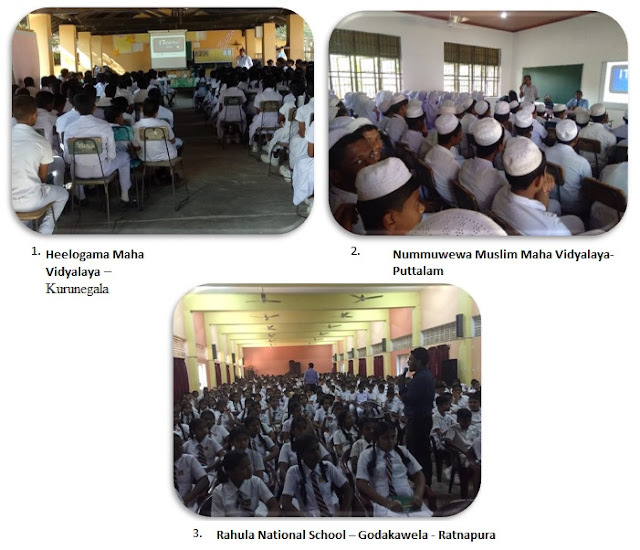 It is connected and privileged to get assistance of national level organizations such as, Sri Lanka Computer Emergency Response Team (SLCERT), TechCERT, Sri Lanka Police and individuals such as students’ counselors, legal advisors attached to different organizations , members of ISOC-LK and LKDR. Some of the individuals have been serving voluntarily. Hithawathi can be described as a supporter, a listener, a guide, a helper to internet users, especially young girls & ladies, teenagers and minors…‘Hithawathi’ educates public recognizing incidents related to cyber harassment, cyber stalks, black mail incidents and cyber bulling..etc. Also ‘Hithawathi’ makes you aware of how to prevent such incidents and is always there to guide if such situations occur. Hithawathi project mainly concerns women, children and those who are victimized or looking for information, however, it is not limited only for females. Anybody can request help or assistance from Hithawathi, regardless gender, age, language or any other limitations. The guidance is served in all three languages – Sinhala, Tamil and English. 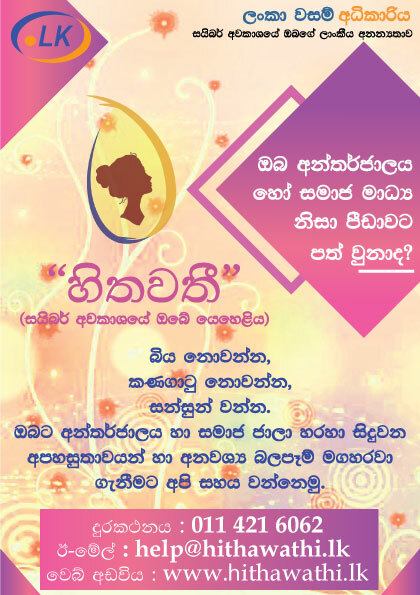 +9411 4216062, email address – hithawathi@isoc.lk to make any request or seek assistance / guidance. 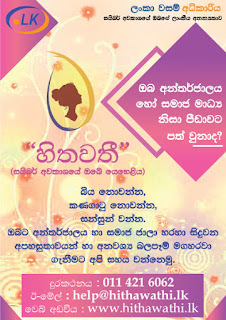 Furthermore, it comes up with a website (www.hithawathi.lk), a blog (https://hithawati.blogspot.com) and a facebook page (www.facebook.com/hithawathi) sharing knowledge, guidelines ( of popular social networking sites), safety tips etc... The website provides guidelines to be safe from some of the harmful internet frauds, identify them and even report them. Currently the hotline is available during office hours – Monday to Friday from 08.30 am – to 5.00pm. It is hoping to extend the service 24X7 in future. If you are happened to meet with any cyber space/ internet related issue and you are not able to figure-out what to be done exactly or to whom to talk , then you may contact Hithawathi. Hithawathi is glad to support you specially directing you what to be done. In some of these cases, the victim may have to make a complaint at the Police yet feeling uncomfortable to discuss some of the incidents with a male partner. Hithawathi caters issues through their helpline, which is handled by well trained and trustworthy female officers, who are willing to kindly listen to the victim and guide them towards the correct path. In addition to the help desk, Hithawathi project will be conducting awareness sessions targeting young and female crowd in the country. මෙම ව්‍යාපෘතිය නම්කරනු ලබන්නේ හිතවතී - ඔබේ යෙහෙළිය යන නමින්. 2014 වසරේ ජනවාරි මස ආරම්භ කරනු ලැබූ මෙම ව්‍යාපෘතිය අන්තර්ජාලය හෝ තොරතරු තාක්ෂණය හේතුවෙන් හිංසනයකට / කරදරයකට ගොදුරු වූවන් වෙනුවෙන් ආරම්භ කල උපකාරක වැඩසටහකි. මෙම ව්‍යාපෘතිය ආරම්භ කරනු ලැබූවේ ශ්‍රී ලංකා අන්තර්ජාල සමාජය(Internet Society Sri Lanka) සහ ලක්වසම් අධිකාරිය (LK Domain Registry) මූලිකත්වයෙන් එහි සාමාජිකයින් විසිනි. එමෙන්ම ශ්‍රී ලංකා පරිගණක හදිසි ප්‍රතිචාර සංසදය(SLCERT), ටෙක්සර්ට් ආයතනය(TechCERT) සහ ශ්‍රී ලංකා පොලීසිය යන ආයතනවල සහයෝගයත්, විවිධ අවස්ථා වලදී ශිෂ්‍ය උපදේශකවරුන්, නීති උපදේශකවරුන් වැනි විවිධ උපදේශකවරුන්ගේ සේවාවන්හි සහයෝගයද මේ ව්‍යාපෘතියට ලැබේ. අතැම් උපදේශකවරුන් තම සේවය ලබාදෙන්නේ ස්වේච්ජාවෙනි. හිතවතී ව්‍යාපෘතිය පිලිබඳව හඳුන්වාදීමේදී, එය අරමුණු කරන්නේ අන්තර්ජාලය භාවිතා කරන - විශේෂයෙන් කාන්තාවන්ට, තරුණියන්ට, යොවුන් වියේ දරු දැරියන් හා බාලවයස්කරුවන් අන්තර්ජාලය සහ එහි සේවාවන් භාවිතා කිරීමේදී සිදුවන අපහසුතාවයන්, වැරදි යොමුකිරීම් , වැරදි සහගත සහ අනවශ්‍ය බලපෑම් වැනි සිදුවීම් පිළිබඳ කතාකරන්න සහ දැනුවත් වෙන්න මෙන්ම එවැනි අවස්ථාවලදී කලයුතු දෑ පිලිබඳව මෙන්ම එවන් අනතුරු වළක්වා ගැනීමට කලයුතු දෑ පිළබඳවද ජනතාවට මඟපෙන්වීමට හිතවතී ව්‍යාපෘතිය කටයුතුකරනවා. මෙම ව්‍යාපෘතියෙන් කාන්තාවන් සහ ළමයින් පිළිබඳව මූළික අවධානය යොමුකළත් එය කාන්තාවන්ට පමණක් සීමාවී නොමැත. වයස්, භාෂා හෝ ගැහැණු/පිරිමි බේදයකින් තොරව ඕනෑම පුද්ගලයෙකුට මෙම ව්‍යාපෘතියෙන් සහයෝගය/ උදව් ගැනීමට හැකියාව තිබේ. සිංහල, දමිල, ඉංග්‍රීසි යන භාෂා තුනෙන්ම මෙම සේවාවන් සැපයේමෙම උපකාරක සේවාව සඳහා සම්බන්ධවීමට ආකාර කීපයක් පවතී. පොදු දුරකතන අංකයක් -+9411 4216062 මෙන්ම ඉලෙක්ට්‍රොනික තැපැල් ලිපිනයක්(email address)– hithawathi@isoc.lk මගින් ඔබේ ගැටලු ඉදිරිපත් කළ හැකිය. 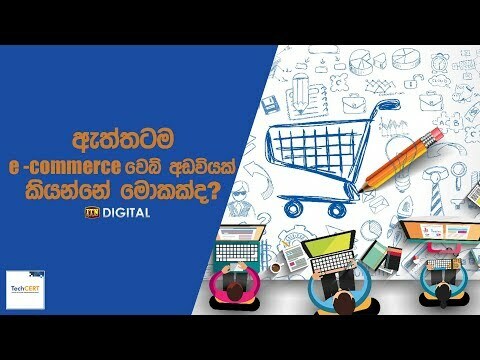 මීට අමතරව www.hithawathi.lk වෙබ් අඩවිය https://hithawati.blogspot.com බ්ලොක් අඩවිය සහ www.facebook.com/hithawathi හිතවතී ෆේස්බුක් පිටුව හරහාත් මේ සම්බන්ධ තොරතුරු, දැනුම සහ මඟපෙන්වීම් ලබා දේ. අන්තර්ජාල සොරකම්, වංචාවන් පිළිබඳ දැනුමත් ඒවා හඳුනා ගැනීම සහ ඒවා වාර්තා කිරීමට පවා මාර්ගෝපදේශන වෙබ් අඩවිය හරහා ලබා දේ. දැනට කාර්යාලයීය වේලාවන් වලදී එනම් සඳුදා සිට සිකුරාදා දක්වා පෙ.ව. 08.30 සිට ප.ව. 5.00 දක්වා හිතවතී ඇමතීමට හැකියාව පවතී. ඉදිරියේදී එය පැය 24X7 ක සේවයක් ලබාදීමට කටයුතු කරනු ඇත. අන්තර්ජාලය හෝ තාක්ෂණික භාවිතයන් නිසා ඇතිවූ ගැටළුවක් පවතින අවස්ථාවදී ඔබ කළයුතු දෑ, ගතයුතු පියවර හෝ ඒ සම්බන්ධව දැනුම් දියයුතු පුද්ගලයන්/ආයතන පිළිබඳව ඔබට නිවැරදි අවබෝධයක් නොමැති නම් “හිතවතී” සම්බන්ධ කර ගන්න. ඒ සම්බන්ධයෙන් සහය වීමට මෙම ව්‍යාපෘතියේ සාමාජිකයින් සහයෝගය ලබාදෙනු ඇත. මෙවැනි ඇතැම් ගැටළු වලදී ශ්‍රී ලංකා පොලීසියේ පැමිණිල්ලක් සටහන් කිරීමට ලංකාවේ නීතිය අනුව සිදුවෙනවා. එමෙන්ම ඇතැම්විට කාන්තා ඔබේ ගැටලුවත් පිරිමි සේවා සහයකවරයෙකු සමඟ කතාකිරීමට අපහසු වීමට පුළුවන්‌. එවිට හිතවතී උපකාරක සේවයෙන් ඔබට හිතවත් ලබැඳි කාන්තා නිලධාරිනියකගේ සේවය ලබා ගැනීමට හැකියාව තිබේ. හිතවතී උපකාරක සේවයට අමතරව විශේෂයෙන් තරුණ සහ කාන්තා ප්‍රජා දැනුවත් කිරීමේ වැඩසටහන් ද ඉදිරියේදි ක්‍රියාත්මක කිරීමට නියමිතයි.